Australia's at it again! This time with Empire of the Sun. 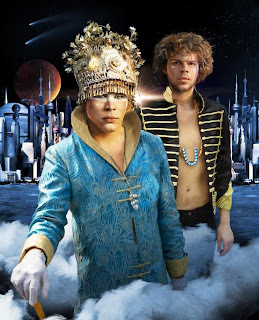 A collaboration between Luke Steele (from The Sleepy Jackson) and Nick Littlemore (from PNAU). They got together to make a great psychedelic pop album called 'Walking on a Dream' which was released earlier this month. Been loving all the tracks I've heard so far, reminds me of the vibe I get from bands like MGMT. They've also managed to get some great artists like Neon Neon and Ted & Francis to remix some of their tracks so you can dance to them as well. The Ted & Francis Remix is a gorgeous mid-tempo burner. Probably my favorite along with the original versions of Half Mast & Walking on a Dream. If you like these I suggest you go buy the album! It's a great one! Here's their gorgeous video for Walking on a Dream, shot in Shanghai China!